INSECTICIDE HABITAT CLEMENT THEKAN Laboratories OMEGA PHARMA rid every corner of your home invading pests and leaves a clean and healthy home. A chip is capable of laying eggs by about thirty days in summer and winter and will proliferate especially where your pet sleeps. That is why vigilance and surveillance should be exercised when your pet is sleeping at home and possibly be a preventive treatment. This agent eliminates external parasites of the environment of your pet. This agent inhibits the growth of larvae in order to completely eradicate the adults but also the eggs at all stages of development. Use of this product may be manual and / or automatic, especially in rooms infested. Efficiency gives you peace of six months. Spray directly on places and objects likely to be contaminated. Close all openings in the room and open all the drawers and cabinets in the room. Place the diffuser in the middle of the room and carefully follow the instructions given. Exit the room and leave two hours before ventilation. External Parasite's (EPA): it is necessary to treat the animal but also its environment to fight effectively against fleas and ticks. 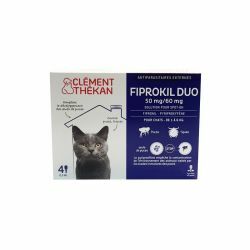 Clément-Thékan offers immediate effect products on parasites for dogs and cats: spot-on, sprays, shampoos, powders, as well as products to treat their environments. To remove attached ticks on the animal, Clement Thékan offers a special "data" product. This product can also be used in humans. Spot-on (pipettes) declined in 5 sizes, one for cats and 4 dogs, depending on their weight. This dosage form has the advantage of being easy to apply. The spray form is available in 3 references (100, 250 and 500ml) and can be used at an early age (2 days). Natural Insect Repellent With its range, Clement Thékan protects dogs and cats against fleas, ticks, sand flies, mosquitoes, lice, chiggers or flies. Based on geraniol, natural assets, this product line without insecticide prevents external parasites infesting the animal, while ensuring respect for the environment. The Dewormers: to treat dogs and cats against worms Clément-Thékan offers a variety of effective products for easy administration by age and size of animals: tablets, oral pasta, sugar, syrup. Reproduction: various treatments are to be given to dogs and cats throughout their reproductive lives. Clément-Thékan offers a range dedicated to the reproduction: contraceptives, anti-milk, infant formula. Dermatology: the skin problems in dogs and cats are common and cause scratching and hair loss. Many skin products are available in the Clément-Thékan range: antipruritics tablets, skin milk, disinfectant spray anti-licking, shampoo, dietary supplement for skin and coat. The Gastrointestinal disorders: vomiting, constipation or diarrhea are classic signs of digestive disorders. Clément-Thékan range has products for these problems: laxatives, intestinal regulator, anti diarrhea, prevention of motion sickness. Food Supplements: to prevent diseases in older animals, Clement Thékan offers tailored palatable tablets. 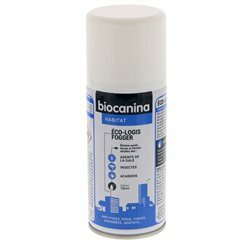 Antiparasitic, Anti-flea, Anti-tick: Discover our range of pest control products BIO, based on natural active ingredients, for your pets: dog, puppy, cat, kitten, guinea pig, etc. We offer anti-flea and anti-tick products based on essential oils or vegetable oils, 100% natural, high quality pharmaceutical, at the best prices. Also find, conventional veterinary products and accessories, to fight against pests (fleas, ticks, mites), available in pharmacies.